Character Cross-overs are nothing new to Comics. So it’s no surprise that DC is about to release the proverbial cross-over hounds this Oct-Nov. The first positive statement I will make about this “Thank the Cosmic Gods… that this isn’t a Universe-Wide Storyline.” (I still have a Blackest Night hangover) While Marvel is just now finishing up it’s year long Universe commitment to Avengers vs X-Men Mega Cross-over, DC is taking us into year two of the New 52 by bringing out the old baddies in a few mini-verse cross-overs. Plot as I know it: Following the zero issues for Superman, Superboy and Supergirl, we are made privy to a terrorist cult that was claiming responsibility for the destruction of Krypton as well as Krypton’s science communities use & abuse of clones, and Superboy’s origin as a clone. A new Kryptonian appears on the scene to be an extremist Kryptonian clone named H’el. High: I’m rather enjoying what the zero issues brought to the continuity of Krypton. The terrorist cult, the history of abusing clones and the family feud between Supergirl and Superman’s parents is fun new material. I’m excited to see where they are going with the current story-lines. I’m also excited to see Lex back in the picture. If you wanted to take down a Kryptonian, who would you ask? Sure as hell wouldn’t be Toyman. The other thing I like about this cross-over is that it’s only three titles. This could have easily spanned 4 titles, but they aren’t including Action Comics, which totally surprises me. Three books a month isn’t that big of a deal, even for a person like me, who isn’t reading any of these titles currently. Low: Even in the New 52 Universe, we can’t get enough Kryptonians. 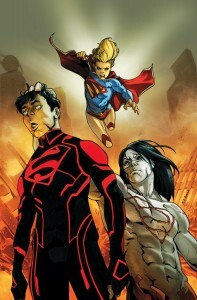 While I like the new plots that have come out of the zero issues, I’m a little irritated that we have more Kryptonians in the present day and with Superboy and H’el being clones, there will always be the possibilities to create more and more Kryptonians. This is one of the reasons I’ve never been much of regular Superman reader. It’s hard to keep the plots interesting and new for me. Plot as I know it: Hal and Sinestro are missing, a new GL has arrived and it has been revealed that the Guardians have, locked away in some cosmic jail cell with other guardians, an imprisoned first lantern. The Guardians have decided that not only have they failed with the Manhunters, but they have failed with the Green Lantern Corps. So now is the time for the Rise of the Third Army! 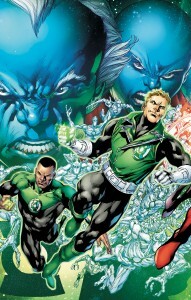 High: The first 12 issues of Green Lantern has been some of the best stuff to come out of the New 52. The Hal/Sinestro storyline has been outright fantastic. Stepping back and looking at the big picture, evolving the Guardians from creator of the corps, to the villain of the corps is a pretty exciting idea. Low: I am still recovering from all the GL big events from the previous DC U and I’m not quite ready to go through another. I’d rather just be reading about Hal/Sinestro, whom, for the time being, aren’t even in the picture. As for the Guardians being the villains, while I like the move and it is most likely inevitable, I don’t like the elimination of the Guardians. I think, while they are abused to death, they still have value for future story-lines. Finally my biggest complaint here is that I currently only read GL on a regular basis. This entire story will span all 4 GL titles, for 3 months, to be total of 12 issues. I’m not interested in committing $16 a month for one story. Plot as I know it: The Joker is back. High: Batman has been the single best book to come out of the new 52. Scott Snyder and Greg Capullo do a great Batman and I’m wetting my pants waiting to see what they will do with the Joker. 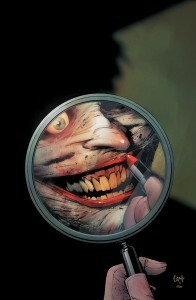 Some of the Bat-verse zero issues tied current continuity to some of the old continuity’s best Joker stories. (Death in the Family & Killing Joke) I’m seriously stoked to see how this will play out. Low: What has two thumbs and is going to wait for the Death of the Family TPBs? This guy! Death of the Family will run from Oct to Feb across 9 titles. NINE! I only read ONE of the NINE! monthly. If you want to get the whole cross-over story, you will be buying 23 books over 4 months with the 24th and final chapter in Batman #17 in Feb. You will be investing a total of $96 ($4 a book) into Death of the Family. I’m pretty bummed about this. I thought they handled Night of the Owls fairly well. The Batman story Court of Owls spilled over into the rest of the Bat-Verse, but did not necessitate the reading of every issue. I would understand crossing-over into Batgirl, Nightwing and Batman & Robin, but Suicide Squad? Teen Titans?… disappointed I am. Until Next Time… I’m kind of sad that the single issue story has kind of gone by the wayside. A lost art even. It’s hard to go out and find good one or two issue stories anymore. That’s probably why I enjoyed DC’s Zero Month so much. I would love to see a resurgence of Brave & the Bold, What IF, Marvel Tales and/or DC/Marvel Comics Presents.